In November, Will Vaus, author of four books on C. S. Lewis, sat down with Dr. Alister McGrath at Harris Manchester College Oxford to discuss his forthcoming biography on Lewis, intriguingly sub-titled: Eccentric Genius, Reluctant Prophet…. 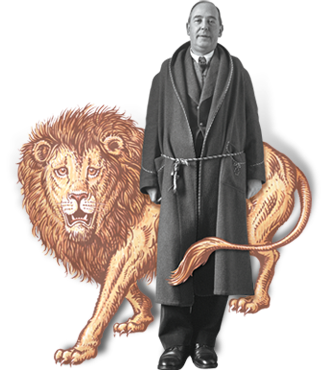 WV: C. S. Lewis, about whom you have now written a biography due out in March 2013, was quite a prolific author, but so are you. How do you manage to write so many books? AM: There are two reasons. One is that I love reading. The other is that I genuinely like writing. So when I want to relax, others might go for a walk, but my instinct is to read or to write. I find it very easy to write books. I’m Irish and the Irish are supposed to have this innate ability to write. The other thing is that I read an awful lot of stuff that I find very stimulating and I want to share what I am learning. One reason why I wanted to write this biography of C. S. Lewis is, and you know this, he is simply fascinating. I thought there were some connections I could make that perhaps had been overlooked and tell the story in a fresh way. WV: You have certainly done that. I noticed one thing about your book that was different than the other biographies of Lewis was that you had set him in context, the context of intellectual ideas that were current during his lifetime, as well as setting his life in the context of world events. AM: It’s a rounded picture I think. But there’s more that needs to be done. I just thought this book would get the discussion underway. WV: So when did you first read C. S. Lewis? AM: I can tell you within a year or two. I did not read him as a child. The first book by C. S. Lewis that I bought and dated was in 1975. So that goes back quite a long way. I was twenty-two and I’d been a Christian for a couple of years. And people kept saying to me, “There’s this guy C. S. Lewis and you ought to read him.” In that phase of my life I was a scientist and was very busy in that and it took me a while to get around to reading Lewis. And the first book I read by him I think was the collection of essays entitled Screwtape Proposes a Toast. I enjoyed the title essay, but the one that really intrigued me was The Weight of Glory. When I read it I thought to myself, “I haven’t quite got this but there’s something here that is worth taking further.” And so I thought, “I really must get to grips with this guy.” And ever since then I just read and read and read. Actually, I don’t know whether this is a testimony to the fact that I am a very strange person or whether it is a testimony to just how interesting Lewis is but I still enjoy reading him and I keep finding new things when I do. WV: How would you say Lewis has shaped your own thought, theologically and otherwise? AM: It’s been a long extended slow burn. I was an atheist and I came to faith when I came to Oxford. And I think the thing that really drew me to faith was a realization that Christianity made sense of things. It was an intellectual conversion. And when I read Lewis for the first couple of times I welcomed him as an exponent of rational apologetics. He reinforced my sense that Christianity really does make sense of things. But as I read him I realized there was a lot more than that: a lot about the imagination and a lot about experience, longing, yearning, and that didn’t really make much sense to me. But actually, as I grew older, my vision of the Christian faith began to expand. Now, here is what I don’t know. He also enriched my vision of personal faith. And while I think there would be many in Oxford who would say, “Lewis is not really a theologian,” I think I would disagree, and I think you would probably disagree as well. Actually he is a kind of theologian who writes for ordinary Christians and can be grasped by them, and I find that enormously encouraging because people need help with their faith. And Lewis is doing what many professional theologians have not thought worth doing or that they couldn’t do, so I admire him enormously. WV: Lewis has at least four apologetic arguments: the argument from morality, from reason, from longing and from Christ. Was there a particular argument that appealed to you when you first read Lewis, or as a former atheist did you think some of Lewis’ arguments shallow? AM: I wouldn’t say shallow. There are parts of his Christological argument, his trilemma for example, where I just feel that it’s not quite as good as it could be. But Mere Christianity was the book by Lewis that when I discovered it, it really spoke to me most deeply. I think I read it properly for the first time in the 1980s when I was working in a parish. It really seemed to give me a very good rational backbone for faith: one I could use in preaching and teaching. It was so accessible and I was able to take some of the arguments you have mentioned and use them in the pulpit. I find Lewis a very important resource, not simply for my own thinking, but helping me to communicate. And that’s one of the things that Lewis is terribly good at. He’s a communicator, not just a thinker. There are lots of those. But thinkers who can communicate—that’s slightly different. I don’t know what your view is, but I think that decision Lewis made to accept the invitation to go round speaking at Royal Air Force bases during the Second World War, where he had to cut down quite a few levels, I think that really helped him. WV: So the argument from morality, when you first read it, it appealed to you and it made sense? AM: Yes, and it continues to make sense. I like the way Lewis began in effect by saying, “Look, imagine this scene…” It’s great. It doesn’t begin by definitions. In effect he says, “Let’s imagine an everyday event. Now let’s just think about this. Let’s tease this out.” And then by the time he’s finished teasing it out, you are well on your way to faith. WV: Now, the first time you read the trilemma where Lewis suggests that Jesus was either a madman, a diabolical liar, or that he was divine: how did you respond to that? AM: I thought, “There’s a good point being made here. But I think it needs a bit more elaboration.” It seemed to me that some might say that was an inadequate presentation of the full range of options. WV: But the only other major option, wouldn’t you say, is that Jesus was some sort of legend? That perhaps we don’t have access, some people might say, to who Jesus actually was, if he even existed. AM: Yes, or he might be a very nice person who’s a bit deluded. But of course Lewis could easily work that back into his argument because the key point he is making, really, is that you cannot say Jesus is a really good religious teacher and ignore the fact that actually linked with that is a very strong assertion of his divinity. And Lewis is right. WV: What stimulated you to write this biography on Lewis, considering that there have been many others written? AM: There are two or three things. One was, that as a professional theologian I felt Lewis hadn’t been taken very seriously. I thought that with this biography I might be able to change that. The other thing I hoped to do was bring my personal experience to bear on this biography. Like Lewis, I was born in Belfast and spent my childhood there. Like Lewis, I was an atheist as a young man, quite an angry atheist. Like Lewis, I went to Oxford, first as a student, then as a don, and discovered Christianity at Oxford. And like Lewis I have tried to defend Christianity. So I just felt that background might help me to tune in to what Lewis was thinking about. The third thing was that because I am a professional historical theologian I could see there were a lot of questions where further research needed to be done. And therefore I ransacked archives. WV: Which archives did you look at, that maybe some Lewis biographers in the past haven’t? AM: Basically what I did was that I went around to every college archive in Oxford and in effect said, “Here’s what I am looking for, have you got anything?” And an awful lot of them said, “I’m sorry, but no.” But because Lewis moved around Oxford there are really quite major holdings at University College, Magdalen College, and interestingly at Keble College. And Keble College is where I struck gold. In effect what I did was to check out and see if we could establish many of the traditional dates for elements of Lewis’ biography. In many cases you can’t. But wherever possible I tried to see what the evidence for them was. WV: And that leads to a major thing that is different about your biography of Lewis from previous ones. You suggest different dates for Lewis’ conversion to theism and even, perhaps, to Christianity. AM: The date of Lewis’ conversion to Christianity, on the whole, stands, I just don’t think it is as straightforward as we thought. But the conversion to theism is, I think, a year later than what Lewis suggests in Surprised by Joy. The reason I noticed this was because I decided to read Lewis continually continuously in chronological order. I did this for fifteen months before I started writing. When I came to reading Lewis’ letters of 1929 I thought, “There’s something meant to happen this year, but the style, the tone, the voice, they’re pretty much all the same.” Into January 1930, then February and things begin to move. Something’s going on here. I just had this subjective conviction that 1930 might be the year. What I then did was to say, “Right, let’s look at all the reasons for thinking Lewis was converted in 1929, then let’s look at all the reasons for thinking he was converted in 1930.” For me the key thing really is Lewis’ reflections on the death of his father. There were no theistic references of any kind, which struck me as being very, very odd. WV: What other surprises did you encounter along the way in your study of Lewis’ life? AM: Another surprise was that I didn’t expect to find that letter from Lewis about Tolkien, recommending him for the Nobel Prize in Literature. There were other surprises I came across, but there were really no shocks, just the nice things that helped me to make sense of things. There are points at which I raise doubts about the traditional narrative, with Joy Gresham for example. Most biographies say that her permission to reside in the United Kingdom was revoked. Actually, it wasn’t; it just expired. That was just a point of clarification that makes a bit more sense of what happened. WV: My feeling reading the biography was that you are somewhat critical of Joy Gresham. AM: It’s going to be very hard to get this one right. My feeling is that the “Shadowlands” romantic story isn’t quite right, that perhaps she was more hard-nosed about this than we may have realized. One of my concerns was that in writing about Lewis that this could easily get diverted into writing about Tolkien a lot, or Joy a lot, and so I decided not to say very much. But I did want to put down a marker that in the next few years I expect some books to appear that may raise questions about Joy’s motivation. And I do that partly because of the sonnets (written by Joy Gresham) which are interesting, and partly because her son, Douglas Gresham, in several interviews marking the centenary of Lewis’ birth in 1998, did say, “Look, my mother came to England to seduce C. S. Lewis.” I think like most people who read that I thought, “That’s just a throw away line.” And then the more I looked at the evidence I thought there could be something here. WV: Did you interview Douglas Gresham and ask him about this point? AM: No, I didn’t. In fact I interviewed no persons. What I did was I made a decision that I was going to focus on written sources, in effect marking a transition from an older style of biography which contains memories of those who knew Lewis to a new style of biography which is based upon documentation, including written accounts of oral history. WV: What was the feeling you got from Peter Bide about his involvement in performing the Christian marriage service between C. S. Lewis and Joy Gresham? AM: Peter Bide was a diplomat, so he wasn’t self-disclosing very much. But still he was quite clear that he had been asked to do something that really put him in a very difficult position. And he had not come to do that, he had come to do something else. WV: So Lewis didn’t ask him to perform the marriage ceremony until after he had arrived to lay hands on Joy and pray for her healing from cancer? My feeling is that Lewis was under such emotional pressure that he didn’t realize that he was asking something that was, perhaps, a bit improper. I don’t make too much of it, but I think we need to realize there are different ways of looking at this. WV: How did you decide about what things to focus on and what to leave out of this biography, considering the wealth of material available? AM: The first thing to say is that I read everything. But I had to make a decision because you haven’t got that much space. And obviously I read all the standard Lewis biographies and I felt there were some difficulties with them. The first was that the table of contents was not adequate. If you look at them they all have single line chapter headings. So I wanted to have a detailed Contents page so you could spot immediately where anything is discussed. And that is, I think, quite a useful feature of this book. But in writing the book I asked, “Who am I writing this for?” And I came to the view that I am writing for people who have discovered Lewis, maybe through the films, or had heard about Lewis, and therefore my job was not simply to give a completely comprehensive account, but to show why this man was so interesting. And that meant that in my own case I made the judgment that some of the writing related to Lewis’ earlier period was not quite as relevant as others might think. Even though I am a very sympathetic reader of Lewis, I find myself bored by very extensive accounts of the Lewis family history. And so I decided, what I’m going to do is take, in fact, a rather minimalist approach; I’m going to say what really needs to be said. And therefore I have a rather short account of his school days. I chose to make that part of the book shorter so I could include more elsewhere, particularly about the early Oxford phase of Lewis’ life. The major organizational decision I made was to treat Narnia as a block in its own right since most readers will have come to know Lewis through Narnia. WV: Obviously Lewis is best known today for the Narnia books. They comprise half of his yearly sales. Why are these books so popular? AM: I often reflect on this question and set Narnia beside The Lord of the Rings. I actually think The Lord of the Rings is better. It has a greater narrative unity. But I think that many people who read Lewis begin with the works that engage their imagination and then follow through to his other works. I think Narnia will continue to be read simply because it is such an enjoyable series. I am of the view that The Lion, the Witch and the Wardrobe must be read first. But it is hard to read that book without wanting to read more. I think Narnia will continue to be read and act as a funnel to draw people into a wider range of Lewis’ books. WV: Where you stand today, what do you find most attractive about Lewis’ life and writings, and what do you find most repellent? AM: What I find attractive is being able to set Lewis against the broad intellectual context. I don’t do this very much in the biography but I do this in the companion volume of essays on The Intellectual World of C. S. Lewis. It’s very clear that Lewis both draws on and contributes to the western literary tradition. Very often he picks things up without drawing your attention to it, and yet he’s clearly picking up images and ideas and narratives and re-weaving them. It’s remarkable. And that’s certainly one of the things that attracts me most about Lewis; he’s someone who can weave together things to produce a beautiful argument or narrative without footnoting everything and saying, “This is where I got this from.” What I find less attractive about Lewis –, well, we are all human beings and have our darker side. I think his relationship with his father, which he himself admitted was not good., I mean he did actually deceive his father. When you bear in mind that his father was a widower and that he supported his son throughout the younger period of his life, I wonder if Lewis might have done things differently. Now, O.K., he wasn’t a Christian at the time, I accept all of that. But it just left me feeling uneasy, I have to say. WV: What do you find most attractive or repellent in Lewis’ works? AM: Attractive, on the whole he is beautiful stylistically; he is able to express things very, very well and approach them in a way that is often fresh and different, the whole way he writes, his range of idioms, his intellectual range is just astonishing. There are some things that trouble me but you have to set these in context. Lewis’ attitude towards women was very much of his age. We’ve moved on so far that actually it is really quite difficult for some of us to think back into his situation. There is an issue there. But we need to bear in mind that Lewis grew up in a family without a mother, he went to all boys’ schools, he went into the army, he went to all male colleges, he didn’t actually have very many women as role models. I think that is something we need to set into the mix there. So, on the whole I emerged from writing this biography knowing much more about Lewis, admiring him more, and being aware there were some “shadowlands” but actually not being worried about them that much. For example, I believe Lewis and Mrs. Moore were lovers. But I suspect, and I cannot prove this, that was in the early phase of their relationship, but I think that actually they moved on from that. But in writing this biography I wanted to avoid any pseudo-Freudian analysis. WV: How do you feel Lewis is regarded now in Oxford? AM: If you go to the web page of the Oxford University faculty of English they’ll talk about how they are one of the country’s best and their leading figures include: J. R. R. Tolkien, C. S. Lewis, etc. It’s a badge of honor for them. That’s very important. Lewis is not recognized as a theologian here. That is something that disturbs me because actually I think a good case can be made for it. I think there is a degree of academic pride here: that people don’t want Lewis to be a theologian because if he is it actually undermines what they are doing. But there is absolutely no doubt that Lewis is seen as a very significant popular figure here in Oxford, but not necessarily by Oxford theologians. When I was writing this biography I talked to an awful lot of Oxford people, some of them very senior members of the faculty of English literature. I said to some of them, “Off the record what do you think of Lewis?” They were very honest and said he was one of the very best Milton scholars we’ve ever had, and he was even better on Spenser. This guy was miles ahead of his time. They were very, very positive and strongly positive about him. WV: Who else is even like Lewis today in terms of being as well read in the whole canon of western literature, and being able to write as well as he did? AM: I would struggle to find somebody. I think what I could say is that I could identify people who would replicate part of Lewis, and they are often the ones who have read Lewis. For instance, I think Tim Keller is doing some very good stuff, and then of course there’s Tom Wright. And there are many others we could mention. But as a coherent single entity there’s nobody. We can’t talk about there being a new C. S. Lewis because there just isn’t. Lewis was himself. Lewis came to faith through literature and realized how literature could provide a gateway for people. And there aren’t many people who have that capacity to write and use literature in that way. AM: I would say it’s Mere Christianity. It continues to be very significant. I think Lewis is the master of the shorter essay and therefore there are a number of essays that would be my top picks. Let me tell you the ones I like best. I mentioned “The Weight of Glory.” I keep coming back to that. I think “Is Theology Poetry?” is awfully good. “The Funeral of a Great Myth” I think is very, very powerful. And there are others I could mention. What I find is that when Lewis is limiting himself to a couple of thousand words, he packs a lot in. WV: You refer to “The Weight of Glory” as an essay, but actually it was originally a sermon. What do you make of Lewis as a preacher? AM: Well, Lewis didn’t preach much at all. The University sermon is slightly different in that it’s almost a lecture. The two I would single out are “The Weight of Glory,” June 1941, and of course October 1939, “Learning in Wartime.” You have to bear in mind that in October 1939, the University had just come back together again and war had broken out. And actually seeing Lewis speaking, reassuring, teasing out, emphasizing what could be learned from this. Those who were there and heard that sermon just speak of the electrifying atmosphere, that he commanded their attention and really spoke to their hearts. It’s very powerful stuff. WV: I guess the criticism would be that you don’t see Lewis tying things back to Scripture in his sermons. Alister McGrath is Professor of Theology, Ministry and Education at King’s College London and author of C. S. Lewis: A Life (Tyndale, March 2013) and The Intellectual World of C. S. Lewis (Wiley Blackwell, May 2013). Will Vaus is the author of several books, including Mere Theology: A Guide to the Thought of C. S. Lewis. This entry was posted in Will Vaus and tagged biography, marriage, Screwtape Letters, Weight of Glory.